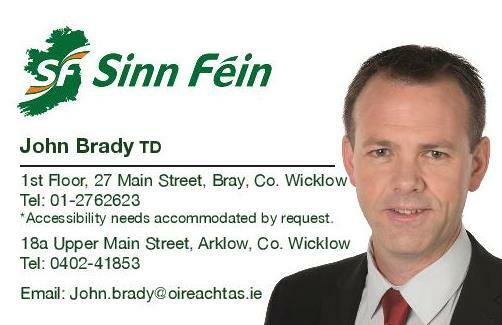 Sinn Féin TD for Wicklow/East Carlow John Brady has criticised Minister for Health Simon Harris for failing to provide an out-of-hours GP service for the people of North Wicklow despite making a firm commitment to do so. “Minister Harris committed to providing a GP out-of-hours co-op for North Wicklow and this was expected to commence last February. “Yesterday, it became apparent that Minister Harris’ plans for this have been shelved by the HSE due to a lack of funding. In fact, the HSE have said that neither funding for the €450,000 needed to run the service annually nor the Winter Initiative is available for the area. “This news has come as a complete surprise to GPs in the area and it appears that Minister Harris has misled the public on this matter. In a recent newsletter, the Minister stated that plans for this service were at an advanced stage. Given that the availability of finances would be central to delivering this plan, it is questionable as to how the plans were ever at an advanced stage as the Minister had claimed. “I am aware that Minister Harris is yet to comment on this matter and I am calling on him to do so today. The Minister must make it clear as to when he was informed that funding for the GP out-of-hours co-op for North Wicklow would not be made available. “The closure of the 24/7 Accident & Emergency Unit at St. Columcille’s and the failure to deliver this GP out-of-hours service adds to Fine Gael’s record of health care in this County. “For the people of North Wicklow, this is simply not good enough.